The paranormal field is a mysterious one, full of things like the disembodied spirit (ghost) which decides to communicate with, and haunt the living, the incredible power of the human mind and will, amazing lights (ghost lights) that appear in the middle of no where, and other things that science can not explain....yet. For the most part, we will try to avoid things of folklore and concentrate on subjects that truly are supernatural phenomena. The main reason why we study the paranormal is to get closer to the truth. We want learn as much about the supernatural in order to better understand it. Although you can find some definitions of folklore subjects in our paranormal dictionary, we try to put our main focus on true paranormal subjects and occurances. Our goal is to become one of the largest resources of paranormal information and to help keep the interest in the paranormal alive and strong. You can click on the books on this page to read about each paranormal subject or use the navigation bar above. If you don't see the subject you are looking for, you can email me at webmaster@studiesoftheparanormal.com and suggest a new paranormal subject. We try to cover as many paranormal subjects as we can think of. We try to add new paranormal content to this site on a monthly basis. I hope you enjoy your stay at my Studies of the Paranormal. Remember, sometimes the things you can't see are just as real as the things that you can! Feel free to email me at webmaster@studiesoftheparanormal.com to ask any paranormal questions or make any comments about this site. Also feel free to send any paranormal pictures or ghost stories you might have. Thanks for visiting my Studies of the Paranormal. Before you leave Please visit these other friendly sites below. Maxs Online income Guide - My new website that focuses on the many ways money can be made on the internet. Its very new so it still has a lot of growing to do but It's still full of a lot of great information! Lucky Loungers - Pet products-Lucky Loungers gives you the ability to custom make your pets bed, coat, carriers and toys. It's simple! Read our Latest Paranormal Article Below! Is Witchcraft Paranormal, or Even Real at All? Witchcraft is not something I usually bring up when talking about paranormal subjects but some people do so I thought I would talk a little about it here for those that are curious about what real witchcraft is all about. First of all I am not a witch or wizard at all so I can't tell you everything there is to know about the subject, but I can tell you what I have recently discovered about this misunderstood subject. One thing witches are not is what you see in most movies and TV shows. There of course is no broom flying, lightning bolts being thrown, or transforming themselves into animals. The practices of real witches is a little less dramatic. What witches are known to practice in the real world are things such as spells for healing, love, money, pregnancy, protection and many many others. Witches also perform curses. Sometimes very nasty ones! You may be asking yourself, do these spells and curses actually work. Well, I found that this is a very debatable subject. In many instances the desired affect was obtained not long after the spell or curse was cast, but how does one prove it was because of the use of magic and not just a coincidence? I can not prove it to you one way or another. I wish I could. It's a very touchy subject between witches and Christians especially. They could argue forever on the subject. I will note that it may be dangerous for one to cast a negative spell on another. If you truly can curse another than you just might find that neggative energy effecting you as well. I find that it is just the way of nature. I don't want to get too preachy but just want to throw that in as a little warning. If the magic of witchcraft is real than how does it work? Well, during these rituals for spells and curses things like candles, incenses, music, potions, herbs, statues, and things of this nature are used to help increase the chances of success but that's just a part of it. The true power of the spell comes from the energy and will power of the one casting it or at least that is the common belief. It's almost like a positive thinking approach to getting the outcome you are desiring. When you are casting a spell or curse you are supposed to be completely focused on your desire and nothing else, be free from any doubt that it will not work, and the objects one uses during these spells and curses are used to help focus your mind on it even further. I for one am a believer in the power of positive thinking. It really does work, but is it a magic, well I don't think I would call it that but others might. Is witchcraft paranormal in any way? Well that depends on where you believe the power of the witch is actually coming from. Not all witches simply focus on their own will power and energy to get the things they desire in life. Some pray to Deities, Saints, and gods to have success with their spells and curses. In this case it could be thought of as paranormal because the power would be coming from a spiritual being as well as the one that was dong the spell casting. If a witch sends a particular demon to go after another and it actually happens than that would surely be a paranormal occurrence. That kind of witchcraft is what gives the stereo type of all witches and I believe is very dangerous, even to the witch using it. Just like any religion or group of people there are good people and bad people, Good witches and bad witches, I just had to say that :)) I am convinced that if there is any paranormal powers of witchcraft it will be found on the dark side of the practice but I caution you to stay far from it. If you do obtain power from dark magic it will not come without consequences. Did you know that President Abraham Lincoln had predicted his own death from dreams he had only 10 days before his murder? His ghost has been seen in the White House on numerous occasions. Also, every April 27th, a phantom black train takes the New York Central rail line from Washington D.C. to Springfield, Illinois which is the same route that Lincolns' funeral train traveled on April 27, 1865. Did you know that the famous Harry Houdini (an early Twentieth Century magician for those who didn't know) began to do mock seances to show people how fraudulent mediums work, late in his career? Also, did you know that he died on Halloween 1926? Did you know that Great Britain is one of the Worlds most haunted countries and that the first official group to come together for studying the paranormal field was formed in London? This group is known as the Society for Psychical Research or the SPR. © Copyright 2006-2013 studiesoftheparanormal.com All rights reserved. 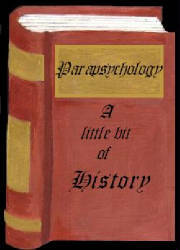 © Copyright 2006-2012 studiesoftheparanormal.com All rights reserved.